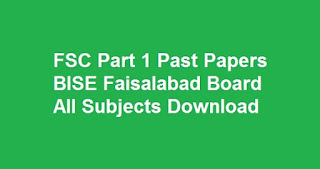 Are you in search of FSC Part 1 Past Papers for Faisalabad Board? and for all subjects? than don't worry, we are here to help you in these regards and we have upload fsc part 1 past papers for all subjects which are being offered by faisalabad board in the syllabus. FSC past papers can be helpful for those want to get highest marks and faisalabad board is one of the best boards in Punjab providing quality education so that their past papers can be a real help for fsc part one students.